While drinking coffee at the Cornerstone Café in Fernwood, I noticed something flickering in one of the trees across the road. 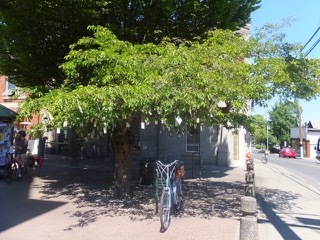 The tree grew in the paved area by the Belfry Theatre–it was some kind of ornamental cherry, I thought–low and unusually broad, the lower ends of its branches either trimmed straight, or growing in remarkable harmony with each other, so that they all ended a foot or so above head-height. Labels or tags of some kind had been fixed at the ends of these branches, rather like fruit, and they were blowing in the breeze, drawing attention to themselves. I soon crossed over to look. There I stopped, brought suddenly close to tears by the suffering inherent in those six words, and by the way the wish was both enormous and modest at the same time Not loved, but known. Was it written by a mother or by a father? In either case, someone who had given up their child, or someone who had been kept from their child. I remembered the drug users I used to work with in a London rehab. Some of them had lost touch with their children, often out of shame, or given them up to foster care or adoption, and dreamed of finding them again one day when – or if – they were living well again. The wish, bobbing on its scrap of paper, was a door into someone’s life story, and an invitation to imagine. The tree was a book, full of lives and possibilities. What we wish for should be what shapes our future. It should,at lest. Did any of these wishes lead to action or to some kind of choice? Did writing them down make them more likely to be acted upon? What did it feel like to have a wish out there on the tree with everyone else’s, rustling together in the breeze, instead of buried, perhaps unspoken, in a corner one’s heart or mind? I can’t answer those questions but I can say that it was exciting and moving to stand under the tree, reading what people wished for. 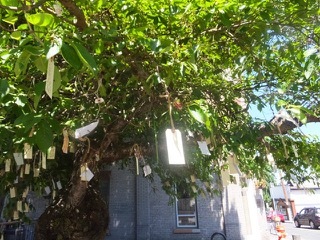 The wishing tree energizes the entire space around it with human desire. It reminds me powerfully that everyone I pass in the street is full of yearnings, large and small, and that this is a wonderful thing, even though the gap between reality and desire is sometimes painfully wide. How did the wishing tree come about? The funny thing is that no one I asked seemed to know, and neither does the internet, though it seems that is it has been there in some form since 2013. Was there a visiting community activist or artist, or did someone just dream it up or hear of something similar, like the idea, buy a packet of labels and stand in the street to get it started? Did it happen during a festival of some kind, or on a regular afternoon, or over a week or an even longer period of time? Are people still adding wishes? No one seems to know. “It was probably just someone from the community,” the servers in the café told me. Fernwood is a place where people do things such as plant community gardens, start festivals, give things away, so that makes sense. 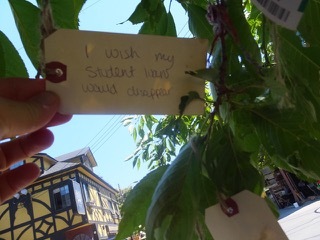 I noticed that no-one else was stopping to read the wishes. Perhaps they had simply grown used to the sight of them fluttering there, or felt they were or should be private. My only regret is that I didn’t have time to read them all; my thanks go to those who thought of the Fernwood wishing tree, and to all those who joined in and made it real.